Remove the tough ends from the broccolini and cut the stems into 1-inch pieces. Add the broccolini to the boiling water and cook for 3-4 minutes, or until fork tender. Using a slotted spoon, transfer the broccolini to a plate; reserve the cooking water. Return the saucepan of water to a boil and add the orzo. Cook the orzo for 2 minutes less than the package directions call for. Season the shrimp with salt and pepper and add them to the skillet. Saute the shrimp for 2-3 minutes, then turn them over and add the garlic. Cook the shrimp with the garlic for another 2 minutes, or until cooked through. Transfer the shrimp to the plate with the broccolini. Reduce the heat to medium-low and add the cooked orzo to the skillet. Add 1/2 cup of the warm chicken broth. Cook slowly until the broth is absorbed. Add the remaining broth, 1/2 cup at a time, allowing the liquid to be absorbed before adding more. With the last 1/2 cup of broth, return the broccolini and shrimp to the skillet. Cook until most of the liquid is absorbed. 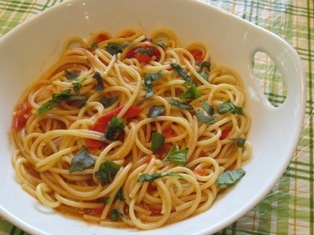 Remove from the heat and stir in the Parmesan cheese and parsley. Season with salt and pepper and serve. Tiny, rice-shaped orzo absorbs liquid and flavor much like rice, and in this recipe the orzo is cooked risotto-style. The orzo does not need to be stirred continually, as with a traditional risotto, but it still will result in a creamy, risotto-like texture. 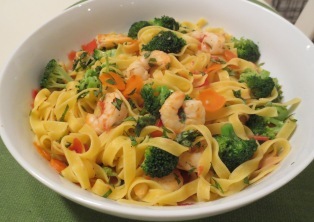 You can substitute chicken or sausage for the shrimp or use asparagus, broccoli florets or peas instead of broccolini. Broccolini is a green vegetable resembling broccoli. Often mistakenly identified as young broccoli, it is actually a natural hybrid of the cabbage family - a cross between broccoli and Chinese kale. The entire vegetable is completely edible from the slim stems to its head of flowering buds.